Time for another edition of Justin’s Junket Jamboree, this time all about Dell EMC World 2016, held in Austin, TX on 18-20 October 2016. Dell paid for my flights and accommodation, with the exception of me paying for a change to my itinerary. I was originally going to come back from the event via San Francisco so that I could meet with clients, but that ended up being sub-optimal, so I paid to change my flights and stay an extra day in Austin. It was many hundreds of dollars because of the cheap fares chosen by Dell in the first place. Ouch. Still, I got a bunch of work done on Thursday night and Friday morning, and I watched a bit of television (the election is making everyone lose their minds) and decompressed after the conference with some simple room service. And I got a a great night’s sleep, so it was worth it. The other usual incidentals like parking, tolls, insurance I paid myself. 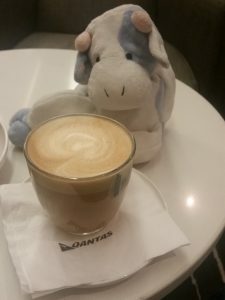 I finally made Gold status on Qantas, so I got to have a proper coffee on Monday morning before leaving in the international business lounge. It’s quiet and peaceful at 7:30am, but gets much noisier closer to when all the planes leave. I nibbled at some breakfasty things like fruit and yoghurt. Cattle class seating on the plane, so usual plane fare. On Monday morning (still Monday, but in the US now) it was a tight connection from LAX to my flight to Austin, so breakfast on the plane had to sustain me until dinnertime. That was fine, because it was #vBBQ out at Salt Lick. Delicious meats! Thanks to Caringo Storage for sponsoring beers, and to EMC Elect, Winslow Technology Group, and Pivotal for sponsoring the event. Also thanks to my friend Bob Plankers for giving me a lift to and from the event, and for not hitting a deer that wandered onto the road on the way back. 12 or 18 point buck did you say it was? I don’t know much about deer hunting other than that venison is delicious. And thanks to Mark May for the pre-dinner beer at the hotel. I dallied in the Marriot’s hotel bar with Mark May and some others from the conference as we enjoyed some amazing Old Fashioneds. Alas we drank all their Woodfords which was the key to making them amazing. Mark and I split the bill. Tuesday morning I slept in a bit and skipped breakfast while I caught up on email. Tuesday lunch was with Mark May and Keith Townsend back at the Marriott to get away from the conference venue a bit. I had tacos (which were fine) and some cornbread that was too rich for my taste. I can see the appeal, but it wasn’t really for me. We used Dell EMC meal vouchers. Tuesday evening there was a pre-dinner reception for press, analysts, and social media types. Michael Dell was around, and Dan Frith got a photo with him. Tuesday dinner was food trucks at the conference event. I had a pretty ordinary burger and some rather delicious chili, and a couple of plastic cups of pretty ordinary wine. Tuesday evening was out and about with a group of friends from social media/conference circuit. We found a fun place called HandleBar which was full of hipster folks with carefully groomed moustaches. They made quite a decent Moscow Mule, so we’d found our venue for tomorrow night’s Mules tradition. We paid for our own drinks, with various people grabbing different rounds. The cocktail list at Floppy Disk Repair Co, Austin TX. Next door to HandleBar is a smaller (and slightly more expensive) place with a sign for The Floppy Disk Repair Co. It’s actually called Red Headed Stepchild, and to get in you have to know the code for the door. The code is an incredibly poorly kept secret, so everyone in Austin knows it, and many out-of-towners now do as well. 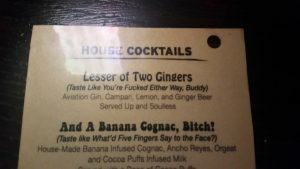 They have amusingly named cocktails with odd ingredients that mostly work. I bought a round of cocktails for our little group of five at this stage. Wednesday morning was the Social Influencer Breakfast put on by Dell EMC, kicking off at the ungodly hour of 7am. Standard buffet fare, but it’s always fun to hang out with the social media folks. Wednesday lunch was somewhere that I forget. Wednesday night I had a press and analysts dinner with some Dell EMC executives, including local MD Angela Fox. I also had a good chat with some local press folks who are based in Sydney. I then headed out for a little Moscow Mules tradition I have with Bob Plankers, Michael Keen (who sadly wasn’t at the event this year), Stu Miniman, and Ganesh Padmanabhan and a few dozen of our closest friends. We hung out at the rooftop bar of HandleBar and it was a fun night. I mostly paid for my own drinks as well as those of various other people. Thursday morning was nibbles and coffee in the press area. Thursday lunch was (thanks to Sarah for reminding me in the comments) with Sarah Vela at this atrocious ‘Mexican’ place called Uncle Julio’s on the corner of E 3rd St and San Jacinto Blvd near the convention centre. I ordered chicken fajitas but was arrived had been drowned in some sort of foaming ‘garlic butter’ sauce thing. I sent it back to get one without this sauce stuff and it still tasted weird. Like the sizzle plate thingo it arrived on hadn’t been properly cleaned in a long time. F-. Avoid at all costs. Sarah and I split the bill. Thursday dinner was a room service turkey sandwich in the hotel because I had over-peopled and just wanted to veg out and get a good night’s sleep. Which I did, after indulging in a little election news coverage on various cable channels. I used a food voucher for this. A Dell EMC compass for navigating the show. (Blue Cow for scale). Prior to going to the show, Dell EMC asked if I’d be okay with receiving a laptop as a gift. I said yes, because why not? and was somewhat amazed to receive a Dell XPS 15 with 500 gig SSD and 16 GB of RAM. It has a touchscreen and Windows 10, and I’m not quite sure what to do with it. I love the keyboard on my Dell Latitude E5530 (that I paid full price for), and it’s my workhorse, but the XPS15 is lighter and more powerful and would probably be a better choice when travelling on planes. It does have the Macbook style chicklet keys that I’d have to get used to, so I need to figure out if I rebuild it with Linux to make it my new main laptop, or leave it running Windows 10 and put Linux in a VM. It also has no stickers, but that can be easily fixed. I snagged a Caringo Storage branded stubby holder/coozie at #vBBQ. 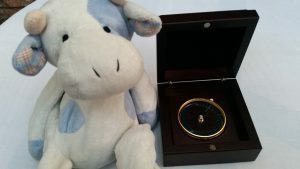 Dell EMC gave us a nifty compass in an engraved box at the “social media influencers” breakfast. Something about helping us to navigate the show. The show wasn’t so large as to need anything other than dead reckoning, but I see what you did there. I believe Wednesday lunch was…that terrible, terrible Mexican place with the foamy chicken fajitas and the “loyalty program” pitch that you should warn your readers never to attend. And I think we split the tab.